Russia's dream start to the Fifa World Cup 2018 came to a crashing halt on Monday, with the hosts suffering their first defeat, and a pretty emphatic one too, at the hands of Uruguay in Samara. Having scored eight goals in their first two games and with a whole country backing them to keep entertaining, the momentum was firmly in Russia's favour, however, Uruguay, with their experience and big-game knowhow, knocked the stuffing out of the home side, easing to a 2-0 victory. Luis Suarez opened the scoring for Uruguay in just the tenth minute, before the South Americans doubled their lead halfway through the first half. It got worse for Russia when Igor Smolnikov was shown a second yellow card on 36 minutes, with it killing any chance of a realistic Russian comeback. With both sides making a few changes, it was Uruguay who started better, with Russia looking a little laboured, almost as if they already had their minds on the last 16, probably knowing that Portugal or Spain, the two likely teams to qualify from Group B, would not make much of a difference in terms of degree of difficulty. Uruguay, though, seemed determined to keep up their momentum and finish Group A with three wins, and they got off to a great start courtesy their main man Suarez. Yury Gazinsky, who scored the opening goal of the Fifa World Cup 2018, conceded a free-kick just outside the Russian penalty are, and Suarez said "thank you very much", placing the ball into the bottom corner. It was a mistake from the highly experienced Igor Akinfeev, with the Russia goalkeeper looking to move to his right, where the wall was set up, and then getting caught out on the other side. Akinfeev was a little wrong-footed again for Uruguay's second goal, although this time you couldn't really blame the Russia skipper. Diego Laxalt, the Uruguay left-back, took a potshot from distance, and the ball looked like it was going to skew wide to the left of the goalkeeper. However, the ball took a huge deflection off Denis Cheryshev and ended up rolling into the bottom corner to Akinfeev's right. An own goal was given and the Russia fans looked stunned. Uruguay probably should have made it 3-0, with Rodrigo Bentancur failing to find a way past Akinfeev, when all he had to do was beat the goalkeeper, but the match was as good as done when Smolnikov made a poor challenge on Laxalt, with the referee left with little choice but to show a second yellow card. Smolnikov, making his World Cup debut, left the pitch almost in tears, but with him Russia's hopes of finishing top of the group also vanished. And just to add a little salt into the Russian wounds, Edinson Cavani made it 3-0 right at the end, finishing off a rebound from close-range, after a Diego Godin header was saved by Akinfeev. Now, Spain, Portugal or Iran await. Egypt and Saudi Arabia played out an incident-filled 1-1 draw, with both teams, perhaps, playing a lot more freely, having already been knocked out of the tournament. Mo Salah opened the scoring for Egypt on 22 minutes, taking down a long ball wonderfully-well, before delightfully chipping the goalkeeper. 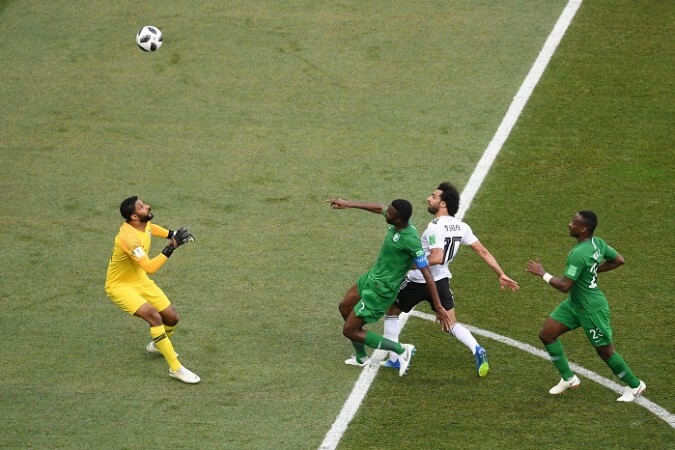 Saudi Arabia were then given a chance to equalise from the penalty spot, but Egypt's 45-year-old goalkeeper Essam El-Hadary, who became the oldest ever player to play in a World Cup, made a top draw save. Elhadary, though, couldn't keep out a second penalty, in first half stoppage time, with Salman Alfaraj sending the goalkeeper the wrong way. Both penalties were a little harsh to be honest, with VAR not intervening in the first, a handball, and the referee deciding to stick to his decision for the second, a push, despite being asked to take a second look by the VAR team. After scoring in first half stoppage time, Saudi Arabia then stunned Egypt by netting the winner in second half stoppage time, with basically the last kick of the game. Salem Aldawsary, the scorer, firing one from an acute angle, after some good build-up play from Saudi Arabia, who to be fair, had the larger chunk of the possession and took a lot more shots than Egypt.